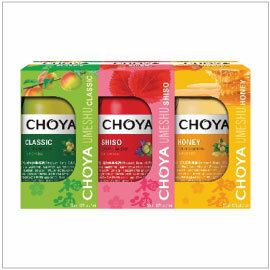 CHOYA, has created a fun trial set called PIO which contains their 3 umeshu flavors—CLASSIC, SHISO and HONEY. “PIO” meaning small and cute in Italian, includes set of 3 flavors is in a little cup (50ml) that provides convenience to drink straight from the cup. CLASSIC gives an authentic umeshu taste with a beautiful balance of sweet and tartness. SHISO provides a unique herbaceous aroma from shiso herb. And finally, HONEY has mild sweetness and pleasant honey aroma followed by notes of almond and marzipan. 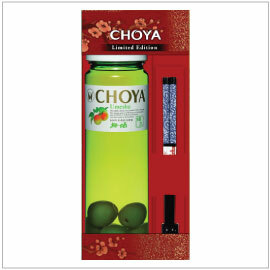 “Chopstick with umeshu” – the new product concept from CHOYA. To not only enjoy the plum wine but also to use the chopstick to taste the plum in the bottle. The chopstick in this gift set is a most highly-prized and famous brand in Japan called Wakasa-nuri hashi. Get your hands on this limited edition set from CHOYA that comes with not only the most popular umeshu in the U.S. but also with the luxury Wakasa-nuri hashi.